The look is sheer and semi-matte. The feel is weightless. 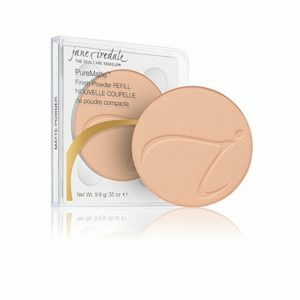 Trust our mineral foundation to look like your skin, only better. Apply in thin layers. Our bases are concentrated pigment so a little goes a long way! Provides Broad Spectrum SPF 20 and UVA P++ protection that is water resistant for up to 40 minutes Because the minerals reflect light, they have a much wider color tolerance than most makeup. You will never see where they begin and end. Swirl our Handi Brush around the cake. Use the side of the compact to tap off any excess minerals. To find the right color, begin with a touch of Amber or Natural on the jaw line. It will be easy to see whether to go lighter or darker, pinker or more yellow.